When you are searching for a way to express your sentiments, but unable to do so in person, then MyFlowerTree is the right place to go to. 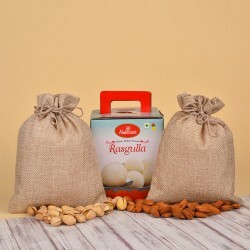 We will deliver your thoughts and emotions in exquisitely packed New Year Gift Hampers. We are sure you will find everything up to your excellent tastes. 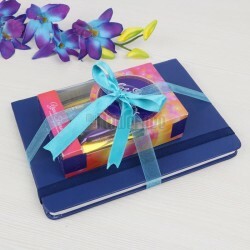 Gift hampers are like those magic boxes which when opened unravel sweet mysteries. Our New Year 2019 Gift Hampers Online are everything but mysterious. 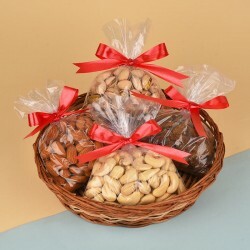 We have a truly sweet, sentimental collection of edible desires to satisfy the perfectionist gift giver in you. Log on today to steal a look at the extensive collection hosted by MyFlowerTree. We make the miles seem less by turning them into smiles with our on time delivery. Feel and bring your precious ones closer with our elegant New Year Gifts Online. MyFlowerTree is a highly ranked gift delivery portal to fulfill all your online gifting requirements. 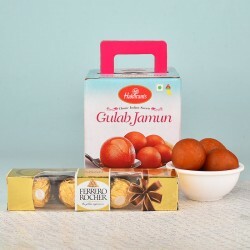 We send fresh exotic flowers, delectable chocolates, yummylicious sweets, personalized gifts and more in New Year Gift Hampers Online. 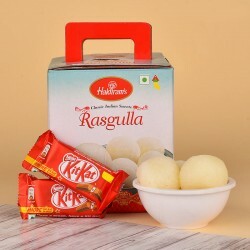 Gift Hampers are a thoughtful way of reminding your childhood friends as to how badly you miss them. Imagine the surprise and how eagerly they will wait to meet you when they receive your New Year Gift Online. 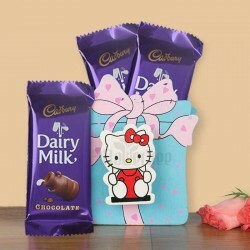 An adorable Hello Kitty Pen Holder along with 3 Cadbury's Dairy Milk Chocolates look so amazing together when given as a gift. 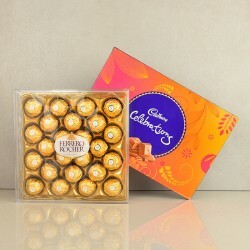 Rekindle the love with your spouse on this new year by placing an order for a New Year Chocolates Hampers Online. Remember those romantic moments spent together as you dive into the sinful delights. 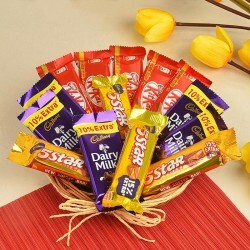 Assorted Chocolates in Hand Made Basket. 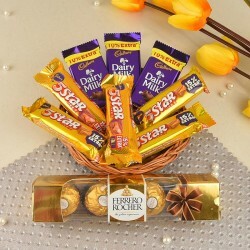 Order now a Basket containing 2 Munch, 2 Barone, 2 Polo, 2 KitKats, 3 Big Dairy Milk, 20 Eclairs, 1 Cadbury Celebration, 2 (5 Star), 2 Dairy Milk Fruit & Nut, and 10 Home Made Chocolates Flowers and Chocolates together are a perfect fusion especially when they are deemed as a gift. This artificial arrangement of Flowers together with this heart-shaped box of 10 assorted chocolates, placed together in a Beautiful Basket, is a perfect gift for New Year Gift Hampers Online delivery to your teachers and office colleagues. Candles that look grand as pillars to throw glimmering, soft light are surely magically thoughtful to count as perfect gifts. Their aroma can calm and soothe for long. Gift this set of three aromatic candles and make the first new year of the recently married bride special. 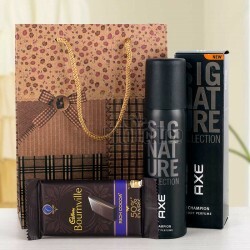 Gift a perfectly arranged gift hamper with each item selected carefully by the expert team of MyFlowerTree. We are in the business of delivering happiness. 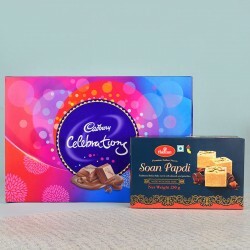 Now by logging into our portal that happiness is just a few clicks away for you as well as the receiver of your New Year Gift Hampers Online delivery. 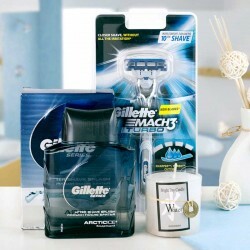 Products in this category have been rated 4.6 out of 5 based on 115 reviews.